Sociologists might say that this is the age of the social network but I disagree. This is the age of tangled wires and USB chargers. I have many, and if you’re reading this review you probably do too. There just aren’t enough plug sockets in the world to charge all our devices these days, and the fixtures and fittings industry is tackling this problem by building USB sockets directly into wall sockets in new homes. The obvious solution for most people, though, is to buy a USB wall charger with multiple charging points. One such charger is the Syncwire 4-port USB charger plug we have here and we found it to be everything we were promised from the Amazon listing page. The charger has two 2.4A sockets and two 1A sockets. The 2.4A ones are ideal for charging tablets like the iPad Air 2 or phones with bigger batteries like the Google Nexus 6P. The 1A plugs are there to look after smaller devices like an iPod or smaller Android phones like the Samsung Galaxy S4 mini. The device itself looks and feels solid. You wouldn’t have a problem believing it cost double the current £12.99 asking price (see below for an exclusive discount). USB cables fit into the ports snugly and the socket itself is small enough to comfortably sit on an extension cable with other devices plugged in either side. The one minor complaint we have about this charger is that it does not support Samsung’s rapid charging technology. Newer Samsung phones like the Samsung Galaxy S7 Edge or the Galaxy Note 5 come with adaptive fast charging plugs that are able to switch to a 9V output in order to charge the batteries on certain devices a lot faster. The Syncwire, along with every other third party USB charger plug we looked at, only outputs at 5V max. And that means if you buy one of these to replace an adaptive fast charger from Samsung, you won’t be able to charge quite as fast as you otherwise would. It’s still fast, but it’s not quite as rapid. 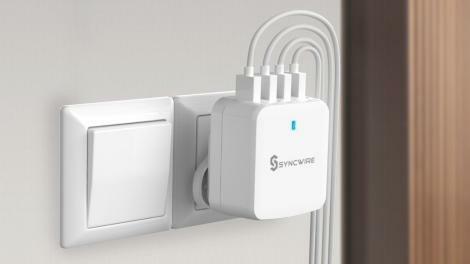 The Syncwire 4-port USB charger plug is cheap and effective. It does exactly what you ask of it and we’d happily recommend it to anyone looking to condense 4 separate charger plugs down into one. It’s particularly helpful to anyone who travels a lot or wants to go on holiday with one plug socket instead of four. Update: Syncwire has been in touch to offer TechRadar’s UK readers an extra 15% off this product. Use the code TechRad1 at the Amazon checkout to reduce the price to a fraction over £11.